If you are British and in any way interested in organic produce, free range poultry and eggs, and low food miles then this could well be the book for you. Grown in Britain is a veritable encyclopaedia of information on seasonal vegetables, organic producers and it has 200 or so recipes to encourage you to use those lovely foods. The author, Carolyn Humphries, has been a food journalist and writer for over 30 years. She is a trained chef and the author of over 60 books. 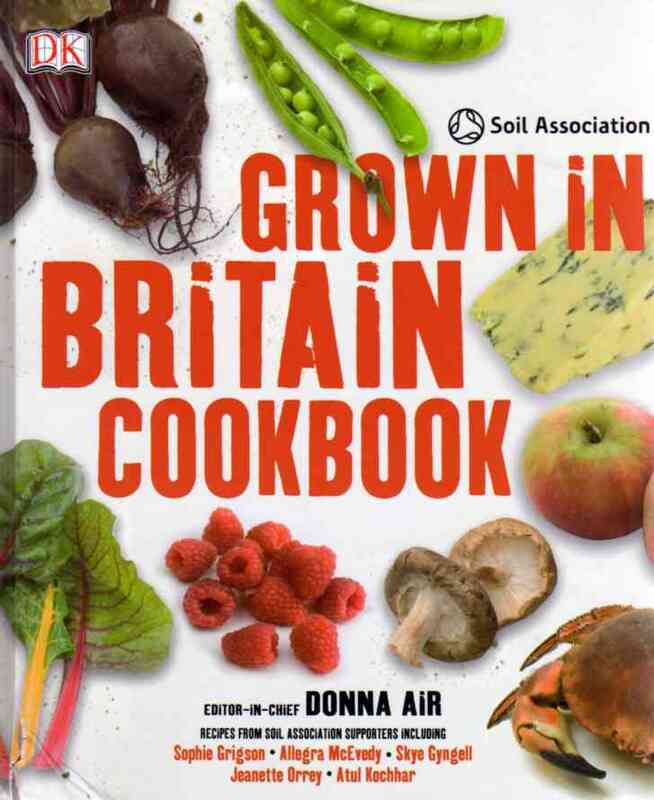 Grown in Britain Cookbook is a collaboration between Carolyn and the Soil Association, who are responsible for the certification of organic food. They have been promoting the links between healthy soil and healthy plants and animals for years. Many of us have concerns for the environment and food safety. There have been plenty of scares lately to keep animal husbandry to the forefront of the public debate. Vegetarians are no longer considered cranks, and these days fewer of us want to buy strawberries to serve with Christmas dinner. Financial constraints might restrict us from being totally organic all the time but Grown in Britain Cookbook will allow us to make informed choices. It’s more important than ever to buy seasonal vegetables when they are at their cheapest and best. Shops are full of every kind of produce so it’s often difficult to appreciate what is actually in season. Grown in Britain Cookbook gives you a month-by-month guide to what’s being harvested, picked, collected, produced or caught. There are ample photographs to show you exactly what purple sprouting broccoli looks like, and recipes that will even tempt you into free food foraging. Wild Nettles and Scrambled Egg only uses 20g of nettles so it won’t take long to collect. They are said to be good for us, being high in iron and minerals, and free, which always makes you feel better. The recipes are a marvellous selection which make the best of fresh produce. It’s not the beige, unappetising and chewy dishes of yesteryear. These will tickle your palate without traumatising your pocket. Fiery Peanut and Pepper Noodles are colourful and flavourful and reflect the way we eat today. Creamy Calabrese and Blue Cheese Puffs will be a welcome and tangy change from sausage rolls. Crunchy Vegetable Crumble is a flexible recipe to use with any seasonal vegetables. The rolled oat topping is a healthy twist on the traditional crumble. The great and the good of the food world have contributed recipes. Sophie Grigson, Thane Prince and Atul Kochhar are a few from the list who support the ethos of buying local and organic produce where possible. Grown in Britain Cookbook is a showcase for fine foods that are fresh and bursting with flavour. Take advantage of good value British produce: we might not be growing mangos and oranges but we have a wider selection of fruit and vegetables than ever before. Consider the environment and serve your family healthy and delicious meals.